Posted in: Church, Clubs, Lansing History, People. Tagged: Freewill Baptist Society, Israel Gillett, Laurens B. Potter. I thought for a moment it would be interesting to look back and investigate what was once located on the site of the Downtown Library in Lansing. What we know is that in 1859 there was a church on the on the site. What is unknown is what was located on the property before the church was built. In a discussion with a colleague, who specializes in early Michigan History, we considered the long held myth that the church was built over a site sacred to Native Americans. He proposed that there was intent by early religious leaders to build churches over sites revered by Native Americans to induce them to attend Christian services. With the church’s location on high ground with easy access to the Grand and Red Cedar Rivers, the location was an excellent site for either a Native American settlement or burial grounds. I must point out that there is neither archeological evidence to support this theory nor any indication that anything was present on the site before the church was built. In fact there has been almost no archeological digs in Lansing except for one at the site of the Turner Dodge house and one at Moores River Park which is remarkable, so little has been done to explore the area’s history before the arrival of the first settlers. It is almost if the state didn’t want to know what was here. 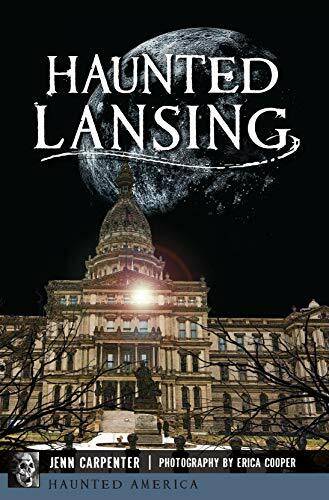 Just look at downtown Lansing on any map, its located at the U in the Grand River, the high ground and the easy access to the Red Cedar River, all were natural features that made the area attractive to early settlers. Next time you are in downtown Lansing, at the Capitol or the Library and look east down Michigan or Kalamazoo Streets and you will see how the land sloops toward the river. What we do know is that the property was grant to the Freewill Baptist church by the Michigan Legislative Branch circa 1850, the legislators also granted ten other churches property in the downtown Lansing area between 1850 and 1867. There also seems to be some confusion as to where and when to the Freewill Baptist Society was founded in Lansing. Frank Turner places it formation at the home of Richard Walton, while Joseph Druse in his pamphlet on early religion in Lansing stated that the Freewill Society was launched in May 1848 at the home of Cyrus Thompson. Francis Adams listed the establishment of the Freewill Baptist Society on August 10, 1848 (Turner 245, Druse 12 and Adams 189). Undoubtedly part of the confusion lies in the fact that three separate Baptist organization were founded in Lansing in 1848 none of which survived the 19th Century so their records were lost. The state of Michigan granted the Freewill Baptist Church the property located on Lot 12 Block 136 in Lansing to build a church and a church was present on the site in 1859. The actual address of the church was a bit confusing; mainly because of the location of the three entrances to the church; one on Kalamazoo and two facing Washington of which one of these was actually located on the Kalamazoo side. So the address of the church was listed as 129 W. Kalamazoo or sometimes as 403 S. Capitol. From what I can tell from the records, the Freewill Baptist Society actually has at least three different houses of worship on the site over the years, one built between 1850-1858, one built in 1876 and the final one built in 1884. It is possible that the church described in the 1876 news article was never built. “Israel Gillett has furnished the Free Will Baptist society of this city with plans for a new church at the corner of Capitol avenue and Kalamazoo street. The estimate for the entire building is $12,000. It will be built of brick with stone trimmings. The entire length will be 124 ½ feet and a width of 65 feet. The style is purely Gothic, with a tower of 106 feet in height. The audience room will be 65 feet long by 40 feet wide. The main front will be to the west on Capitol avenue, with three entrances. This is a good idea, for in case some one shouts “fire” or otherwise creates an alarm in the congregation, there will be plenty of ways of getting out these door. [really I wonder how often this happens] Therefore we shall have one public building in this city in which the Cincinnati horror cannot be reenacted. [During a performance or the play the Great Republic at Cincinnati’s Robinson’s Opera-house a young boy misleadingly cried fire and a panic ensued. The audience was mainly women and children and when panic subsided twelve people were dead] Neither does this society mean to be troubled with damp basements, but they have planned a vestry room at the east end of the church, 58 by 34 feet. The height of the ceiling in the auditorium is to be 36 feet, and the walls will be 18 feet above the water table. The exterior will be finished with buttresses and 12 minarets, and the whole will be surmounted with a slate roof. The church will be heated by steam and no pains will be spared to have it perfectly ventilated. Work will begin in the spring, although it is only expected to complete the western portion of the building, containing the church proper during the coming summer. Mr. Gillett’s skill in drawing plans has made this a very handsome building on paper, and when fully finished according to these designs, it will be an ornament to the city” (LRSW 2/15/1876). “The new Free Will Baptist church at the corner of Capitol avenue and Kalamazoo street will be formally dedicated next Sunday. Rev. Dr. Dunn of Hillsdale will preach the dedicatory sermon a 2 o’clock, and other interesting exercises will take place in the evening” (LJW 11/14/1884). “The new Free Will Baptist church on Capitol avenue to be known as the Park church was dedicated last Sunday afternoon with appropriate services. The house was crowded to overflowing, many being unable to gain admission. The pastors of the various local churches, together with a number of former patrons of the Baptist society, occupied seats neat the pulpit and took part in the exercises. Rev. Dr. Dunn of Hillsdale preached and able and eloquent sermon. Following it the pastor, Rev. A.E. Wilson, formally dedicated the church in a few impressive words. A prayer by Mr. Wilson concluded the services. Thus far the building has cost $6,200, of which sum $2,200 is still owning. $1,000 of this has been provided for, and a considerable additional sum was subscribed Sunday afternoon. The vestry and steeple are still unfinished. These when completed, will bring the total cost of the church up to about $9,000” (LJW 11/21/1884). In late 1905 the old Park Baptist Church was purchased by Independent Order of Odd Fellows Capital Lodge Number 45, which converted the church into clubrooms. The main room was 61×38 feet with 58×35 feet of the area available as dance space. The room was painted dark red with green trim and a cream colored ceiling with the old pews mover to the side walls to serve a seats for the tired dancers. The lobby or anteroom was 20×20 feet with two regalia rooms in the corner. These rooms were constructed to hold the masonic symbols, insignia, dress and emblems of the organization. There was also a lobby for lodge room where candidates waited before being admitted to the lodge room for initiation. All very hush hush on the description of these rooms. The old Park Church and I.O.O.F. Hall was torn down in 1921 and replaced with a gas station and car dealership. So ended the legacy of Laurens B. Potter.